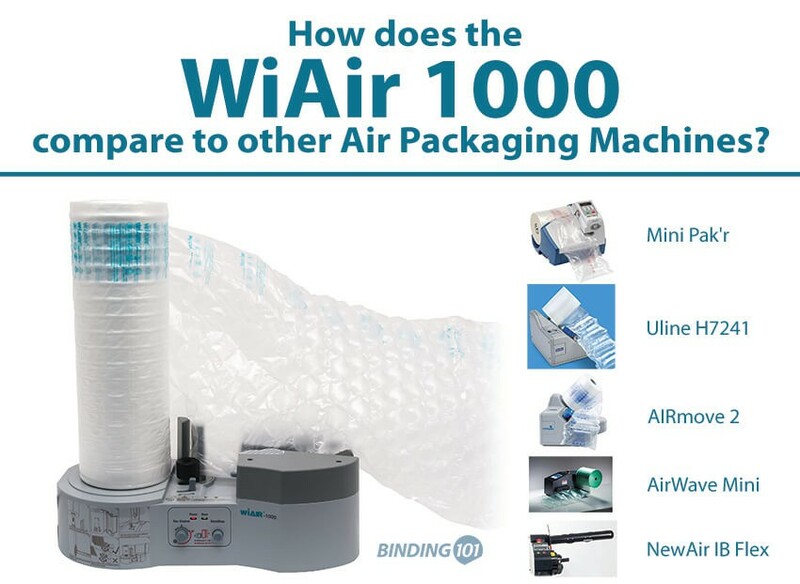 How does the WiAir 1000 Compare to other Air Packaging Machines? The WiAir 1000 is a new innovation to the packaging industry, as it offers not only an initial lower price for the machine itself, but also lower pricing on consumables, less need for inventory storage, and even lower shipping costs. Yes, seriously! Plus, loading the air cushion rolls and using the machine is truly simple, so anyone from a small businesses owner to a professional warehouse shipping department of a large company will easily be able to use it. Here is how the WiAir 1000 air packaging system compares to other available machines on the market. Footprint 18" x 8 ½" 14" x 13" 15" x 14" 17 ½" x 17 ½" 9" x 15.74" 26" x 23"
• Speed of Machine - The first thing you will see on the chart above is a comparison of how fast the WiAir 1000 is compared to the other models. You can see that the WiAir is slower than the others, however, this makes is much more accessible to lower-volume users including those that own their own small businesses that needs to pack and ship items, such as Etsy shop owners. This can save small businesses a ton of money from outsourcing and buying pre-made bubble wraps. • Film Types - Next, we look at the kinds of films they will work with, i.e. the kinds of finished air packing they will produce. All models mentioned will work with both a pillow air film and a bubble air film. They are also all proprietary, meaning they will only work with their brand's specific film rolls. This is an important thing to note, as the consumable pricing for your continuous-buy air packaging supplies should be considered when making a buying decision. The WiAir 1000 offers a much more affordable film that takes up less space than traditional bubble wrap, so will also take up far less storage space. 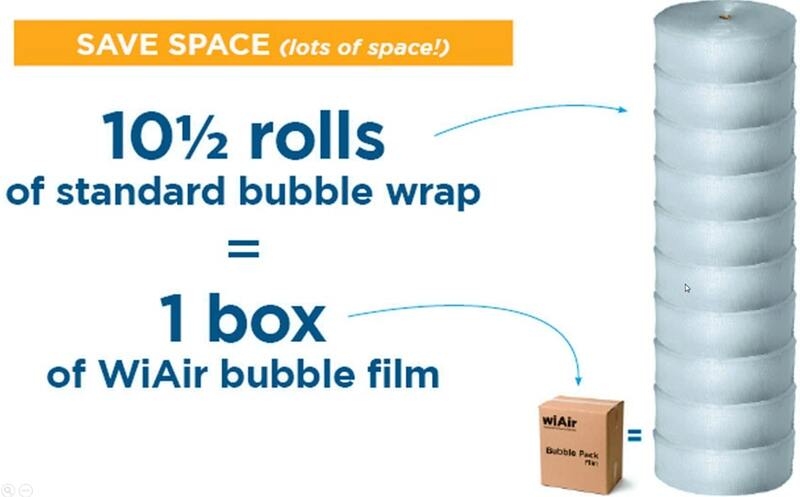 Just check out this photo to compare a box of the WiAir film to comparable amount of bubble wrap on a roll...what a crazy difference in space! On the same topic of film type, you also want to look at the material that the film is made of, the durability of it, and the waste-factor. Well, the WiAir uses a unique, high-density polyethylene HDPE air packing film that is incredibly resistant to punctures (keeping your shipments safe through transit and storage), abrasion resistant (will always look new), exhibits a low coefficient of friction (low-static), and is completely recyclable, making it more eco-friendly than traditional packing peanuts and other protective packaging solutions. Lastly, in regards to air packaging film, you should look at the finished pillow size. The WiAir 1000 pad air tubes (bubble wrap used for cushion wrapping materials and void fill) comes on a 15 ¾" x 11 ⅖" x 985' roll size, yielding 1,350 pre-perforated pillows measuring 15 ¾" x 11 ⅖" (400 x 290mm). The air pillows (single cushions used for void fill) come in a 7 ⅘" x 3 ⁹/₁₀" x 985' roll size, yielding 2,700 pre-perforated air pillows, measuring 7 ⅘" x 3 ⁹/₁₀" (200 x 100 mm). • Sleep Mode - A standby mode is a nice feature that will automatically shut off the machine after a certain amount of inactivity. This can help you conserve energy to reduce electricity costs, as well as reduce wear to your machine and help it last longer. You can see that the WiAir 1000 has a timeout after 2 hours of inactivity, which is a benefit because it will start protecting your machine and saving your energy, while allowing you the freedom to step away from the machine to perform other tasks, without having to go through the startup process again. There is only a 3 minute startup time to get the machine up and running again, so it is quick to get it going. • Space Needed for Machine - Also called the footprint, the space needed for your machine is an important consideration, especially for smaller businesses with limited space. Take a look at the width and depth of the machines in the chart, and check the location where you plan to place the machine to be sure it will work. The WiAir 1000 is one of the more compact options, so can save you some space. • Retail Price - Lastly, let's compare the price of the machine. This is a very important factor, because we know you have to work within a budget and ensure your equipment investments will pay for themselves quickly. As you can see, the WiAir 1000 is the cheapest (or more accurately put, the most affordable) air packaging machine available, retailing at just about $449, which is less than half the price of any other comparable model. Do you still have questions about the WiAir 100 and how it compares to other models on the market? Please call us at (866)537-2244 (866)537-2244 so we can help! * Retail pricing is current price as of the date of release of this article (09/26/18). Prices may have changed after that. Always check individual product listings for current pricing.